When we have a strong and loving mind, our whole experience of the world changes. Love is not something we reserve for just one person, but instead is a powerful mind of cherishing that we can learn over time to extend to everyone. In these three very special events, we’ll have a chance to experience, at different levels, the expansive mind of love and tap into an inner protection that will never let us down. Everyone welcome! In this Friday Night Lecture, Gen-la Kelsang Khyenrab will help us courageously look at resentment — a more subtle mind of anger over past hurts. We will learn special methods to skilfully remove this painful feeling of negativity that we carry in our heart. In this way, we can create space to fully experience mental peace and happiness, greatly improving the quality of our love in all relationships. In this special Saturday Day Course, Gen-la Kelsang Khyenrab will share Buddha’s powerful, time-tested meditation techniques designed to help us connect with and expand the natural love we all carry in our hearts, harnessing its amazing power to bring enormous benefit to ourselves and others. By improving our good heart and moving our mind to love, we can make our life joyful and truly meaningful. 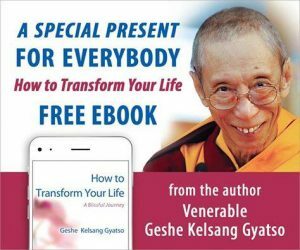 In this Special Sunday Morning Class, Gen-la Kelsang Khyenrab will provide an opportunity for us to understand clearly and practically how to unify our busy daily life and these profound meditations on love as the only real method to solve daily problems of anger, depression, conflict and disharmony. Everyone receives benefits from these practices, please feel welcome to join us. With nearly 35 years of experience, Gen-la Kelsang Khyenrab is an internationally renowned meditation teacher and Buddhist monk. He is greatly admired for his powerful teachings, clear & practical presentation, and pure example of humility and loving-kindness. *Lunch will be provided Saturday and included in registration as part of the day course. Please also note that no physical tickets will be issued for this event. Once you register, your name will be added to a list, and you can simply check-in at registration the day of the event. Any questions about your registration can be directed to info@meditationinmadison.org or by calling 608-661-3211. Advanced registration helps with planning purposes for the event, and also ensures you a seat in the meditation room (the first 100 to register). There will be additional seating available in our community room with video link. Same-day registration and drop-ins are always welcome! **Complete your Valentines Day Package! Attend any or all of these three special events, and receive a special package deal for you and a friend to kick off our New! Drop-in Class How to Transform Your Life beginning February 14. More details will be available at the Center on the day of each event. ** If you have any questions, please contact us at info@meditationinmadison.org or at 608-661-3211.